The naturally occurring asbestos that delayed construction of the Boulder City bypass for months is no longer an issue, and construction is expected to begin in the spring, according to the Regional Transportation Commission and the Nevada Transportation Department. Several Boulder City residents, city officials and agency representatives held a town hall meeting at the Elaine K. Smith Center Sept. 18 to discuss issues facing the city as a time line for construction was laid out. Among the issues was the naturally occurring asbestos, a thorn in Boulder City’s side that delayed the project by four months after UNLV professors discovered it in the area. The agencies ran more than 600 tests to determine the severity of the asbestos. The results were the asbestos is in minimal concentrations. Representatives said they don’t see it posing a serious threat. None of the 150 surface and subsurface rock and soil samples taken by the Transportation Department had concentrations above 0.25 percent, according to test results. Of the 461 samples tested by commission, 14 had concentrations above 1 percent, the level where measures need to taken to reduce risks of exposure. Even though the tests didn’t show anything severe, both agencies said they will take precautions to ensure that workers and residents aren’t exposed to the asbestos. Three types of monitors, including some outside of the construction site, a few on site, and personal monitors that some workers will wear will be used to help determine the amount of asbestos in the air. According to geologist Bradley Erskine, the Occupational Safety and Health Administration requires about 25 percent of workers in each construction area wear monitors to determine the air quality. The 8-inch monitor clips to the worker’s belt buckle, which is connected to a plastic tube that runs its way up the back and clips onto an area close to the mouth. The filters are taken to a lab to determine the amount of asbestos in the air. “You want to know the next day what that person’s exposure was so you don’t allow it to happen a second day,” Erskine said. The filters from the other monitors are taken to a lab once a week. Erskine, who specializes in naturally occurring asbestos, said exposure can be different depending on what job the worker has, but said it’s important to analyze each section so risk can be kept to a minimum. Howard Booth, a 25-year Boulder City resident, said he still has some concerns about the asbestos. Booth has pulmonary fibrosis, a respiratory condition where lung tissue is damaged and scarred. The thickened tissue makes it more difficult for the lungs to work properly, according to the Mayo Clinic. Doctors have yet to pinpoint the cause of Booth’s condition, which has him concerned as construction gets underway. Fellow resident Milo Hurst said he was never concerned about the asbestos. “I think that was a couple professors getting a little grant money,” he said. Transportation Department Project Manager Tony Lorenzi said he understands residents’ concerns about asbestos. Las Vegas Paving Corp., Ames-Fisher and Eldorado Mountain Constructors are the three companies bidding on the bypass. Proposals, due Oct. 16, will consist of a technical layout and costs, Hand said. A committee will review the proposals and decide in December who gets the project. When asked who was on the committee, ublic Works Director Scott Hansen said the information was confidential. After a contractor is selected, it must acquire important assets such as insurance and bonding, Hansen said. The contractor will build an office in Boulder City to help oversee construction, which is expected to be completed by summer 2018. Hurst said he was impressed by the number of people who showed up to the meeting. 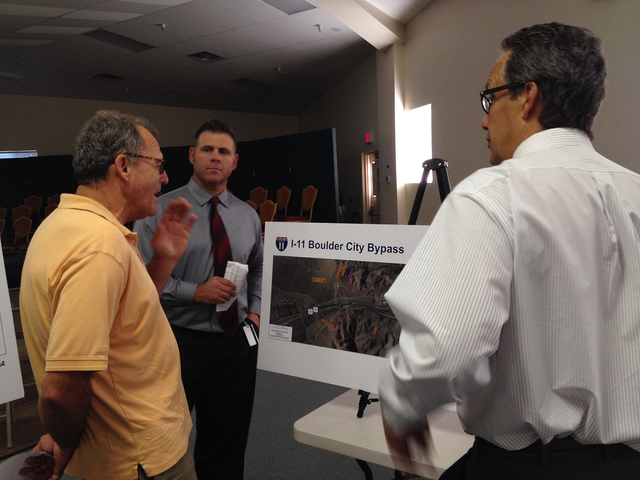 White boards loaded with information were easily accessible for residents to view, as well as a video simulator that showed the interstate’s proposed route around Boulder City.